Temperature readings in the 40s seem like a distant memory now as the forecast for Wednesday calls for a high near 80. It’s a warming trend that’s just starting to gain traction, and by the weekend could produce readings into the mid-80s. With winds veering to the south, the heat could well be accompanied by humidity, making the start of the weekend a sticky one around South Florida. 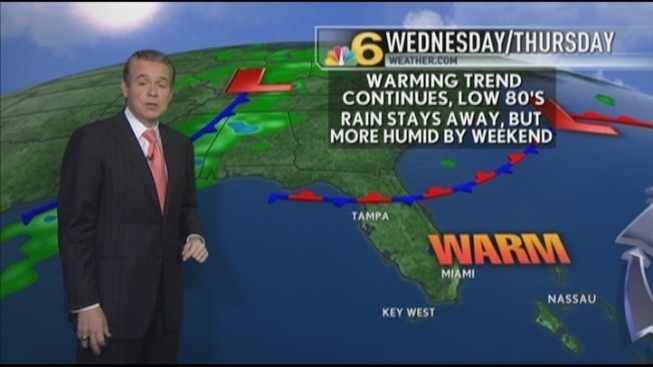 For now, though, beautiful weather is expected Wednesday and Thursday with partly sunny skies. Then Sunday expect a cold front to approach, and a better chance of rain.